Rani is the director of Hope Public Charitable Trust (hopechennai.com, Regd. No. 1125/2007) in Chennai, India, which provides specialized education and training to children with disabilities; Rani also runs a full-time home for youth with disabilities who are without a safe place to live. Priyam Global was founded to work in partnership with Hope Trust to support and empower the mothers of children in Hope’s special education school. As the project co-founder, Rani is the program director and oversees budgets, planning, and project implementation. Gereena is a recent MSW graduate who joined Priyam Global in November 2107 as program coordinator. 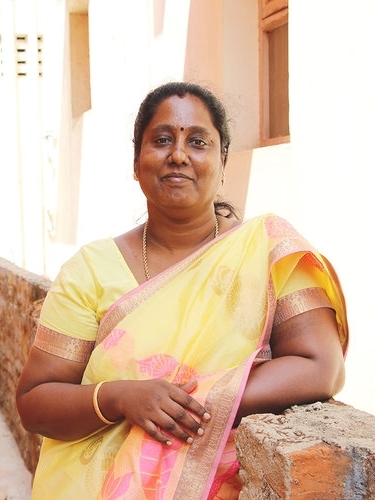 Her role includes understanding the goals and needs of each mother and helping them to create individualized plans, leading parent education sessions, coordinating work skills training, and assisting the director to gather information and data for measuring Priyam Global's program impact. Gereena also holds a bachelor’s degree in nutrition. Michaela founded Priyam Global in 2014 with the aim of supporting global efforts to improve the daily lives of children with disabilities in resource-poor communities. In 2016, she co-founded Priyam Global’s current women’s empowerment program with Rani Anbazhagan in Chennai, India. Michaela advises on Priyam Global’s organizational strategy, program design, and long-term development. She holds a master’s degree in public health and has worked as an independent consultant in public health program design and communications in the United States, Egypt, Uganda, and Haiti.